It didn’t take long for Chad Beebe to gain the trust of quarterback Kirk Cousins. Promoted to Minnesota’s active roster to fill in for an injured Stefon Diggs, Beebe was targeted twice on the Vikings’ opening drive against Detroit. He caught a short pass from Kirk Cousins on third-and-4 for two yards — his first career NFL reception — and hauled in another on the very next play to move the chains on fourth-and-2. Beebe caught his only other target for six yards on a third-and-3 in the second quarter, picking up another first down for the Vikings. He made the most of his opportunities, appearing in 27 percent of Minnesota’s snaps (13 total). Brandon Zylstra played just one offensive snap. Overlooked on draft day in April, the rookie Beebe fits right in with the Vikings’ talented group of wide receivers. Only Laquon Treadwell, a first-round pick in 2016, was selected any time before the fifth round. The others: Diggs (fifth round, 2015), Adam Thielen (undrafted, 2013), Aldrick Robinson (sixth round, 2011) and Zylstra (undrafted, 2016). It’ll be interesting what the Vikings decide to do once Diggs comes back healthy after the bye week. Will they stick with six receivers on the active roster? If Minnesota waives Beebe, it’s possible another team would scoop him up before he could rejoin the Vikings’ practice squad. 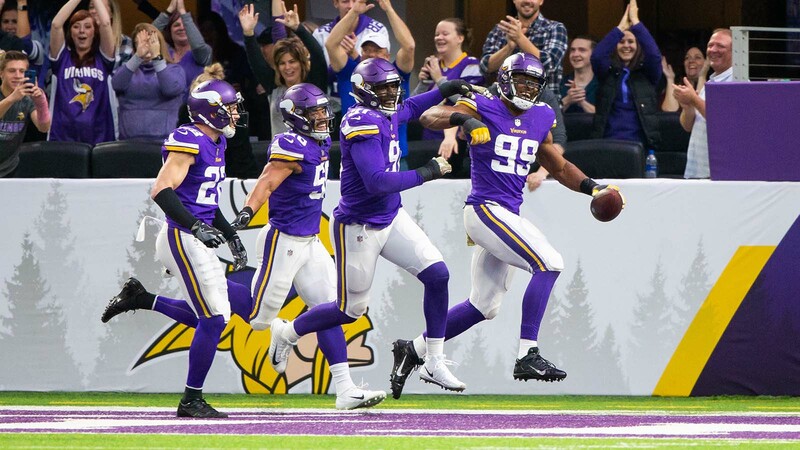 — Anthony Harris started the game in place of an injured Andrew Sendejo and was one of three Vikings to play all 70 defensive snaps. — Everson Griffen tallied his first sack since returning from a six-game absence last week. He played in 74 percent of the snaps against Detroit, up a bit from 70 percent against New Orleans in Week 8. — Dalvin Cook was in for 28 plays, more than Latavius Murray’s 22. Murray had led Minnesota running backs in snaps the previous six games. — After missing three games, Riley Reiff returned from injury to start at left tackle and played in all 49 offensive snaps. — Wide receiver Robinson played a season-high 26 snaps. Both of his catches resulted in first downs, although he couldn’t haul in his other target on the day — a perfect deep pass from Cousins on third down that Robinson got his hands on but couldn’t bring in.